Waist Height Tripod Turnstile Access Control Gate - Set Of 8 By Hiphen Solutions Services Ltd.
Access Control Tripod Turnstile is integrated with mechanism, electric and micro-controller and various kinds of identification technologies, compatible with IC, ID, barcode, fingerprint reader and so on to provide intelligent control and management to flow control. Durable, anti-rusty. Provide orderly passage to people, anti-illegal entry or exit, smooth operation, low noise. Arm drops off in condition of emergencies. 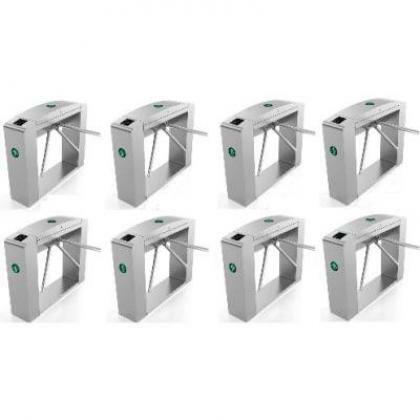 Access Control Tripod Turnstile is widely used in bus station, port, subway, factory, mansion, residential area, hotel, and companies and so on any place that requires a smart flow control. 7.It is with standard electrical interface to connect various kinds of readers and writers for easy integration and also computer far control and management can be realized by computer. 11. If working with software, the total-in-population can be set to satisfy special request. 12. Re-position function. After card reading, if passenger not through within the specific time, system will auto cancel passing right for this time and the limit passing time length can be set. 13. Card Mouting is avaliable. 14. Uncompleted wheel turning system is adopted for locking the turnstile in zero, and unlocking will be more realiable and accurate. Door Lock With RFID Card Access Control - 304 Stainless - 4 Set By Hiphen Solutions Services Ltd. Door Lock With RFID Card Access Control - 304 Stainless - 5 Sets By Hiphen Solutions Services Ltd. Door Lock With RFID Card Access Control - 304 Stainless - 6 Sets By Hiphen Solutions Services Ltd.